To create a new corporate identity for this family-owned start up business. This client wanted to break into the farm-to-school market to bring healthy, locally grown food choices to public school children. Competing in a highly priced structured environment, this new business needed a design that could open doors for them. Hosting food fairs and tours was not enough when dealing in a government structure. A brand identity was needed that would feel safe and approachable for school administrators and buyers. They needed a high-end design that would allow them to tell their story. Create a down-home look and feel that would help them form relationships and provide a strong foundation for signage and other marketing efforts. 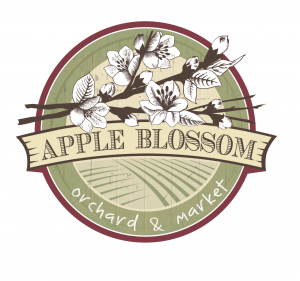 Using a stylized apple blossom illustration over a wooden cask holding a farm field scene, this logo is self-contained for ease of use on labels, signs and other marketing materials. Classic and handwritten fonts emphasize the historical country appeal of this business. Knowing school children are learning about farming practices and getting healthy food to eat.